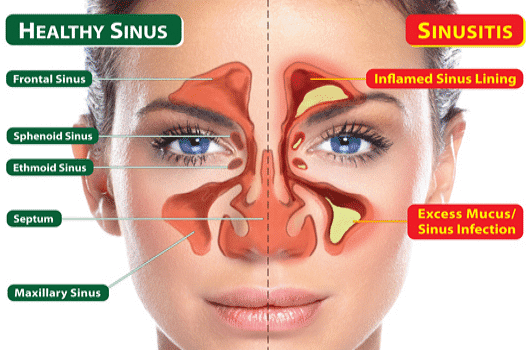 Sinuses are small, air-filled spaces (cavities) inside the cheekbones and forehead. They are lined with mucus membrane which continuous with that which lines the nasal cavity. This sinus mucus membrane makes mucus which drains into the nasal passage (nose) through small channels. Sinusitis is when the membrane lining one or more of the air-filled hollow spaces in the cheekbones & forehead (sinuses) becomes inflamed. In response, the sinus lining or membrane produces extra mucus that builds up in the cavities. It is then prone to infection by bacteria. Sinusitis is broadly classified into acute and chronic sinusitis. Typically lasts up to four weeks and is caused by a viral infection. This is a common ailment that occurs not more than three times in a year. This type of a sinus infection usually occurs after an upper respiratory infection such as a cold. Usually symptoms lasts longer than three months. This form of the condition requires that one should visit a doctor for a check-up as it may also be caused by any other disease that has chronic sinusitis as its symptom. The medical terms acute and chronic refer to how long you have a condition for, rather than how severe it is. 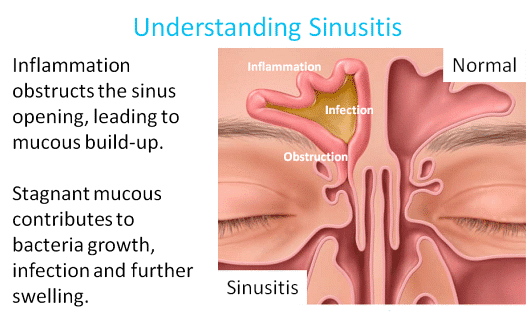 There are a host of reasons for chronic sinusitis to occur, such as the person developing nasal polyps (benign tumor or outgrowth), an allergic reaction, tumors or respiratory tract infections, be it fungal, bacterial or viral in nature. • Sinusitis is more commonly an after-effect of a viral infection, such as a cold or flu but can also more rarely be seen after bacterial or fungal infections. 1. Allergic Rhinitis - this may cause swelling of the tissues on the inside lining of the nose and block the sinus drainage channels. This makes the sinuses more susceptible to infection. 2. Variant Anatomy of the nasal cavity such as nasal polyps, deviated or large nasal septum and/or turbinates may also block sinus drainage channels. 3. Facial injury or surgery and certain congenital facial or nasal abnormalities. 6. Poor immune system as seen in HIV and chemotherapy. • Sinusitis produces a throbbing pain, pressure and a blocked feeling in your nose, face, forehead and headache. • The symptoms are often worse when you bend over or lie down. • Other signs of sinusitis are a stuffy nose and losing your sense of smell or taste. • Facial tenderness with pain. • If the infection has turned into a fever, you may also feel pain in your teeth or when you chew food. • Even if the virus does not spread from your nose to your sinuses, you can still get pain and pressure in the sinuses when you have cold. This is because a blocked nose prevents mucus from draining down the small passages that connect the sinuses with the nasal passages. • Sinusitis tends to be recurrent and many people will have the problem every time they catch a cold. In some cases, infection from an upper tooth can reach the sinuses. You can also get sinusitis by jumping into infected water feet first. What Can I Do Immediately To Make My Sinusitis Better? • Rinse your nostrils with salt water to help clear the mucus from your sinuses and nasal passages. • Ask your pharmacist about decongestant sprays and tablets. Or take standard painkillers such as aspirin, paracetamol, or ibuprofen to ease sinus pain. • Soften the mucus with a steam inhalation. You can do this by adding menthol, cedar oil or eucalyptus oil to a bowl of hot water or your bath, then breathing in the steam. • Buy a vapour rub and apply it to your chest before you go to sleep. • Do not smoke and stay away from smoky or dry environments. • Blow your nose gently, one nostril at a time. • Put a saucer of water next to a radiator to keep the atmosphere moist. What can I Do Generally To Avoid Sinusitis? • If you are prone to sinusitis, use a decongestant as soon as you get a cold to prevent mucus from building up. • Avoid catching a cold during the winter months by staying fit and healthy, eating and sleeping properly, and avoiding places that are crowded or badly ventilated. There are a number of products for dealing with the pain and discomfort of sinusitis. These range from simple painkillers, such as aspirin, paracetamol and ibuprofen, to cold medicines that contain both a painkiller and an ingredient to unblock your nose, and decongestants in the form of tablets, capsules, nose drops and nasal sprays. Ask your pharmacist which product is best for you. Many are not suitable for children. Nose drops and nasal sprays reduce mucus production and swelling of the membranes inside your nose. However, you should not use them for more than a few days at a time, as they may make your symptoms worse. Oral decongestants should be avoided by people with high blood pressure or heart disease. • If you have severe sinusitis does not improve after five days of treatment. • If your face starts to swell, particularly around the eyes. • If you develop a fever and increasing pain in your forehead or around your eyes. • If you develop chronic sinusitis with symptoms lasting longer than 3 months. Chronic sinusitis can sometimes develop from an acute sinusitis. This is the most common complication. Chronic sinusitis causes similar symptoms to acute sinusitis but lasts longer. Other complications are rare. However, they can be serious. These severe complications are estimated to occur in about 1 in 10,000 cases of acute sinusitis. They are more common with infection of the frontal sinus. Children are more prone than adults are to complications. Swelling or redness of an eyelid or cheek in a child with sinusitis should be reported to a doctor urgently. • Relieve your symptoms with a salt water rinse, a steam inhalation, painkillers or decongestants. • Consult your doctor immediately if there are any signs of complications such as redness of an eyelid or cheek or if you have developed chronic sinusitis.